The only self-drive you can't overtighten. Includes an inner cam that continues to rotate once outer cam reaches maximum torque. Maximum 20kg safe load. Supplied with screws. Ideal for hanging clocks, picture frames, light switches and light bathroom fittings. Updated self-drive design addresses common issues faced by users. No pilot holes or pre-drilling required. 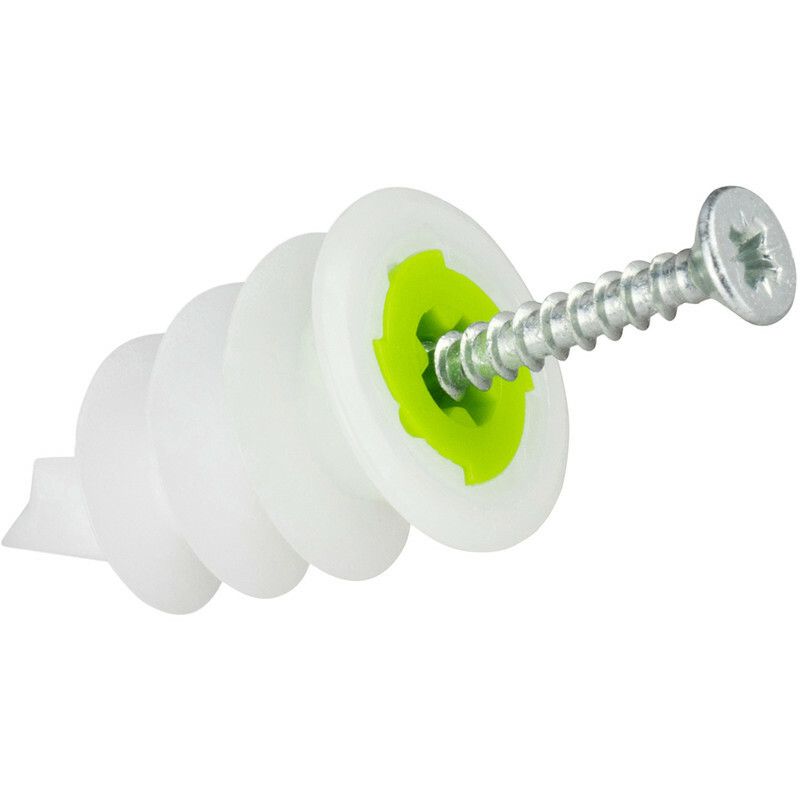 TwistIt Self Drive Plasterboard Fixing Nylon (200 Pack) is rated 1.0 out of 5 by 5. Rated 1 out of 5 by Anonymous from Rubbish What an absolute waste of time and money. But for the fact it was over 30 days between buying and trying, they would have gone straight back to toolstation for a refund. Absolutely useless piece of kit. Rated 1 out of 5 by DMCD from Not good in any way Double sheet wall. They don’t self drill, even after drilling a large pilot hole the stop half way and strip the screw head. Used 20 to finally get 8 fixings. Rated 1 out of 5 by tsneal from Unusable fittings for plaster board Where to start. I have always used the metal self tapping plaster board fittings but thought I would try these, despite the lurid green insert. However, they do not self tap into plaster board; you will need to pilot drill first. In addition, the feature ratchet cuts in before the insert has fully seated in the plaster board. :-( Thrown them away and bought the more expensive fisher metal inserts instead. Rated 1 out of 5 by mudhut from Not recommended - multiple issues with this item Bought on the strength of the other Gripit products for holding up a lightly loaded shelf. DiY I may be but pretty experienced - 50 years of it in and out of the building trade. Issue 1: the device did not penetrate a plasterboard wall that has been plastered. The plastic point is sharp but does not penetrate well enough for the cutting edges to start to work. Increased pressure causes the device to wobble on the end of the driver (PZ2 bit in drill/driver). Looks like it might be OK in plain unplastered plasterboard. Issue 2: Having manually formed a small hole to start the device so the cutter could work, the built-in clutch was not man enough for the job - plastic chewed up. Possible the finishing plaster was too hard again. Issue 3: Having made the hole a little bigger to get the thread started and changed the device for an undamaged item and using somewhat more pressure, the device bit into the board and the clutch did not release. The device went right through the plasterboard and into the void behind. Gave up here and used a yellow Gripit. There's no information on whether these things can be used on plastered surfaces or only on bare boards. I recommend you save your money and use some other type of fixing - the original Gripits work really well.